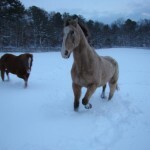 Why do horses roll in the snow? As life went on, Eileen became increasingly busy with school, sports and college. Her early dreams of having a horse were deferred while she focused her attention on the more immediate goal of getting into the television production business. Years later, Eileen’s husband, Jim, introduced her to horseback riding by sharing trail rides in Montauk. In 2001, Eileen decided to get more directly involved in the horse world by taking lessons, learning the basics of dressage. Safety has always been of the utmost importance to Eileen. Despite all pre-cautions, during her third lesson, Eileen had a near-death accident. Thankfully, she was wearing a helmet which saved her life. Being a determined and committed athlete, Eileen did get back in the saddle the very same day. Though she was enjoying the time with horses at her lessons, it never felt right to Eileen when she heard the instructor yell directions to “kick him harder” and “whip her with the crop”. Curious and always asking questions, Eileen wanted to know, “How does the horse know to turn on the forehand?” The instructor replied, “Oh, that’s too complicated for you. Only experts can do that. Don’t worry about it.” Neither of these attitudes jived with Eileen. It seemed unnatural. Eileen continued engaging in horseback riding lessons the “normal” way for a couple of years. 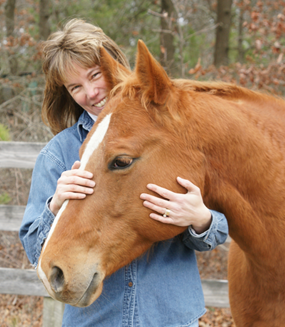 Then in 2003, Eileen acquired Warrior, a rescue horse who had been passed around. Eileen and Warrior had a great time for about six months, stealing many rides. The previous owner had used “the John Lyons method” with Warrior, whatever that was. After one good toss from Warrior, Eileen decided to find out what this John Lyons thing was all about. There and then, Eileen absolutely fell in love with the concept of Natural Horsemanship and non-resistance training. 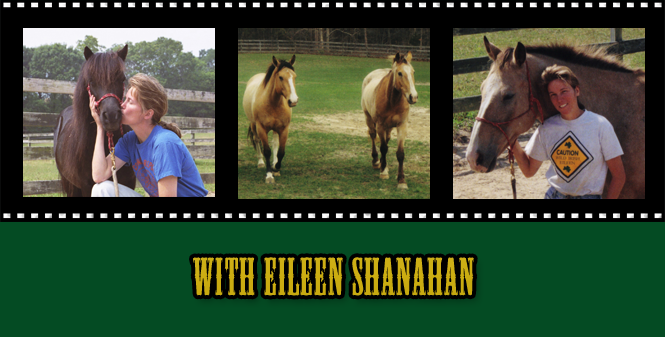 In addition to the John Lyons method, Eileen has taken lessons with local instructors on Long Island who studied Monty Roberts and Pat Parelli. Having a love for horses but not necessarily a knack for being the lead horse, Eileen is on a journey studying and searching how to be a good leader for her horses, hence “Talkin’ Horses”. Acquiring knowledge from different Natural Horsemen and Horsewomen has given Eileen the information she needed to overcome fear and begin to provide leadership for her horses. For more than 25 years, Eileen has been shooting, editing, and producing television programs and commercials for Cablevision. Programs include the Cable Ace Award-winning “Long Island Magazine” as well as the Telly Award-winning “Neighborhood Journal”. Additionally, Eileen has won several editing awards. Currently, she is the Area Director for Cablevision’s Local Programming. Occasionally, throughout her career, Eileen has had on-camera appearances. She did sideline commentary and interviews for the sport program “Long Island Rough Riders” and reported for “Soccer Zone”. Eileen appeared as an extra in a movie portraying a television news camerawoman in Fred Carpenter’s “Murdered Innocence”. Eileen Shanahan recently debuted on the big screen as Override’s FBI Agent, Diana Crowley. In addition to her love for animals and television production, Eileen loves her country. She is an American who recognizes that freedom is precious, yet, not free. Eileen supports our troops by volunteering as Vice President for the New York Leatherneck Ball, a subsidiary of the Marine Corps Scholarship Foundation (MCSF). The MCSF honors Marines by providing educational scholarships for their children (http://www.leatherneckball.org). Vacationing with your Horse Have you ever vacationed with your horse? Well that is what “Talkin’ Horses” did as they headed upstate to New Berlin, NY, where Natural Horseman Tony Simonetti and family are building their dream at Pure Country Campground.